Being connected to your friends, family and everyone else online can be awesome! But nothing we do online is really private, including emails, text messages and even the apps you use on your own phone! Don’t worry, you’re in control of how much or how little you want to share with your friends, your networks and the world. As long as you know how to use social media and the internet safely, you can protect yourself! How can I make my phone safe? Just like you put a case on your phone to protect it on the outside, you can protect your apps and personal info on the inside. If you’re not sure what info your apps have access to, you can review app permissions through your phone’s privacy settings. In your settings, you can also make sure location settings are off and that your phone isn’t regularly charging your credit card or posting on your social networks. Feel free to ask an adult for help doing this! Cyberbullying refers to cruel or bullying messages sent online. These might be from former friends, people you go to school with or other people you know. Sometimes it’s hard to know where it’s coming from or who’s doing it because of screen names, but if someone is sending you mean messages online, don’t be afraid to ask for help! If I think I’m experiencing cyberbullying, what can I do? It’s often recommended that you ignore bullying messages instead of responding to them, but we know that’s tough! Instead, you could try to delete or block bullies, so you don’t see their messages or texts. Ignoring cyberbullying isn’t your only option, and you definitely don’t have to face it alone! It’s a good idea to get help from a parent, school counselor or another trusted adult. That’s especially true if the cyberbullying contains threats. The internet is a great place for young people to do research for school, share pictures with friends, play video games or check out the latest trending videos. It’s important to remember that billions of people access the internet, so there are lots of opportunities to connect—but not everyone has the best intentions for doing so. It is never okay to bully someone. Bullying someone online—through email, social media, text messaging or any other website or app—is called cyberbullying, and it is a form of bullying. It’s important for young people to think critically before sharing personal information, pictures or videos online. Nothing on the internet is completely private, but young people can avoid unwanted contact and unwanted content by using online safety tools, understanding privacy and location settings and keeping strong passwords. It’s best to start conversations about online safety early. Instead of trying to figure out what your child is doing on social media and with other technology, coach your child through each platform and strategies to explore safely. With your help, your child can grow as a person by exploring the world of technology and the internet while you provide a safety net of trust to fall back on. Sit down with your child to look at funny videos or pictures, creating the space for your child to be comfortable with you and your online presence. 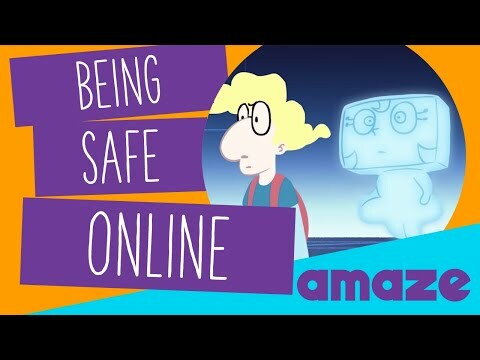 What is your line between safe and unsafe practices online? What does and does not feel okay? What are some things you’ve heard about cyberbullying? Do you know anyone who has experienced cyberbullying? How did it resolve? What suggestions do you have to reduce instances of cyberbullying?